You are currently browsing the tag archive for the ‘food movement’ tag. Small Group Conversations Create Root System of Commitment, Action: Update from Cleveland! 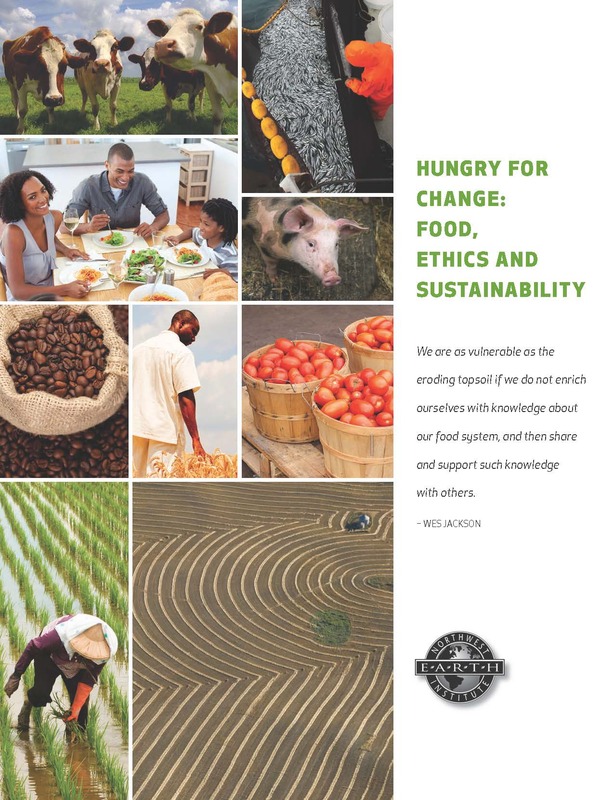 This article just in from Axiom News per the effects of Northwest Earth Institute’s programs and the work of Clevelanders in creating more sustainable local food systems. Thanks to all the people taking part in this inspiring effort! 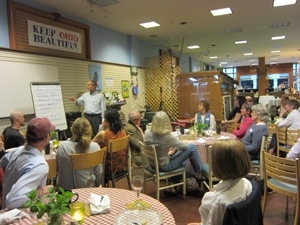 Read on to see what Clevelanders are doing as a result of participation in Menu for the Future. With its array of homemade goat cheese, pasta made with basil pesto grown onsite, chili with local venison and spicy collard greens, a local food potluck last night captures the difference a growing underground movement around local food is making in Cleveland. The potluck’s location, Gardens Under Glass, is a story in itself. Situated in Cleveland’s downtown Galleria mall, the core of Gardens Under Glass is a demonstration greenhouse with food grown there now used in some of the food court businesses…Then there’s the fact the potluck was held at all. Capping off six weeks of small group conversations around food, it was intended to be a celebration of what the more than 30 people engaged in these conversations have learned, and the new micro-communities they’re beginning to create. Perhaps most powerful is how these conversations are sparking change at the citizen level, as people shared at last night’s event, says champion for the effort Nancy King Smith. A young couple has been inspired to start growing some food even though they don’t have any garden space. So they put buckets of dirt on their balcony and have planted several vegetables. Someone else has learned more about CSA’s (Community Supported Agriculture), and now he and his family have joined one. A woman noted that in spite of her busy schedule, she has a new commitment to put time into her food choices and preparation because that’s what’s important to her. The owner of a local business is now committing to become a City Fresh stop and provide fresh, local, sustainably-grown produce in the Buckeye-Shaker neighborhood. One urban farmer noted that through these conversations he could “see the light bulbs” of understanding going off for people. Based on a curriculum developed by the Northwest Earth Institute, called Menu for the Future, the conversations spin out of handbook readings and a set of questions. They have been credited with changing the nature of the food conversation in the community of Port Townsend, Washington. 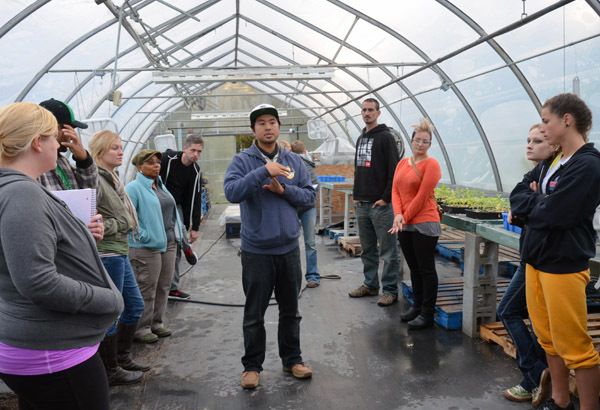 The goal for the budget-less Cleveland project, relaying entirely on word-of-mouth, is that 50 groups have met by the end of the year, with a farmers’ potluck in the fall to celebrate and share experiences. “They had a fall potluck in Port Townsend, and people did share some pretty exciting things that they were motivated to do as a result,” says Nancy, noting she’s hoping for a similar experience in Cleveland. The Menu for the Future movement was sparked at last year’s Sustainable Cleveland 2019 summit, an initiative to turn the city into a world-leader in sustainable practice. For the initiative, a theme is chosen for each year, with events, education and activities all lifting it up. Local food is the 2012 theme. The city’s chief sustainability officer, Jenita McGowan, who is the lead connection point on this citizen-driven project, points to Menu for the Future as a favourite example of several highlighting the growth of the local food ecology in Cleveland.